For TVO this week, I discuss Brampton Transit’s impressive ridership growth. In the last five years, Brampton Transit has bucked the trend of stagnant ridership numbers encountered elsewhere in the Greater Toronto Area and North America in general. I argue that Brampton’s success in improving transit ridership comes from sustained investment over many years, the move to a grid-based route structure, and the introduction of Züm, a basic network of semi-frequent, limited-stop bus routes, many of which extend outside of Brampton’s boundaries. I grew up in Brampton, and I have collected maps since kindergarten; my collection includes several old Brampton Transit maps. These maps help to illustrate the progress made since the 1980s, when the level of service provided was quite basic. Brampton Transit began operations in 1976 after the old Town of Brampton’s local bus service was amalgamated with the dial-a-bus service operated in Bramalea. (Brampton amalgamated with most of Chinguacousy Township in 1974, including Bramalea.) 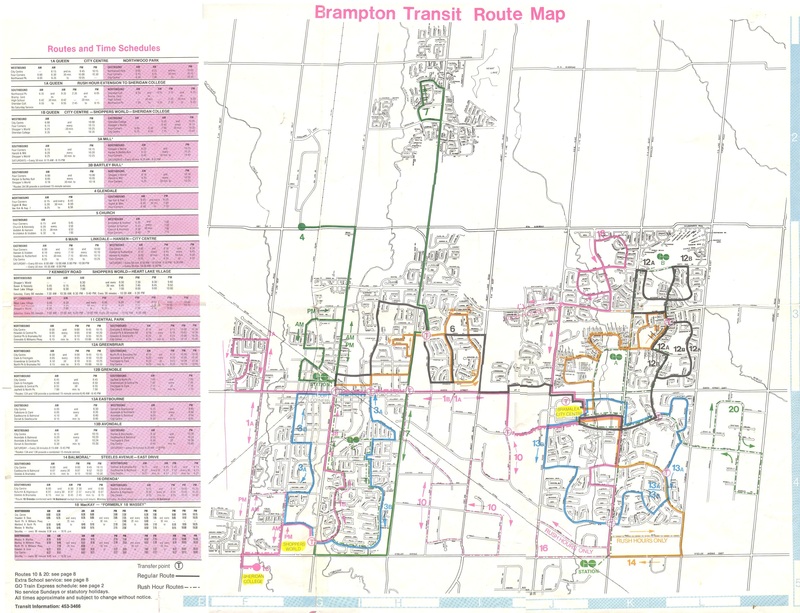 In 1980, Brampton Transit operated 14 routes, serving a community of just under 150,000 people. Buses operated no later than 9:00 or 10:00 PM, Mondays through Saturdays, and many routes operated with long, meandering loops. Apart from GO Transit, there were no connections to nearby communities. By 1988, service was offered on Steeles Avenue to Humberline Drive in Etobicoke, where connections could be made to TTC buses on the 96 Wilson and 73 Royal York buses, but didn’t continue east to Humber College. Brampton Transit Route 14 Torbram served Westwood Mall in Mississauga, and connections to Mississauga Transit could be made at Shoppers World. But still, service levels were poor — you were lucky to get a bus every 30 minutes outside of rush hours. Permanent Sunday service wouldn’t come for another ten years. Notable are the four lettered bus routes — A, B, C, and D — that made direct connections to the four weekday GO train round trips to and from Toronto. 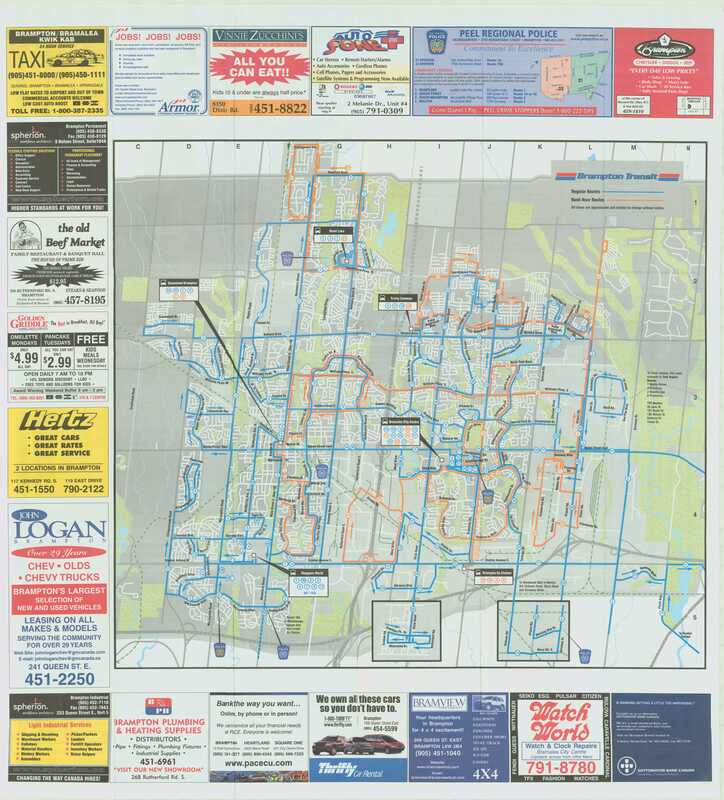 Brampton Transit’s maps of the era are also historically notable because of their advertising: only one of the Burger King locations shown on the 1988 map still exists. Other restaurants advertised — the Old Beef Market, O’Henry’s, and Queen’s Pizzeria — are no longer in business. 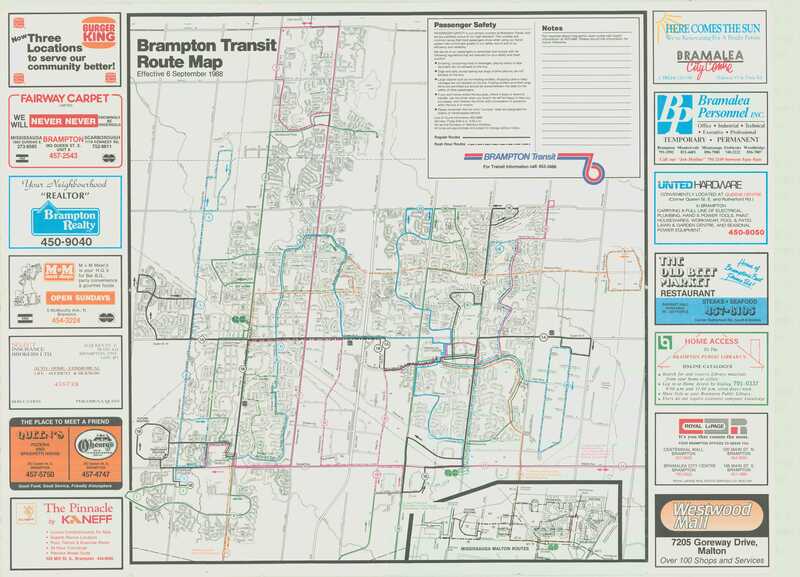 Brampton Transit Maps published in the 1990s and early 2000s were printed on newsprint, and used only a two-colour scheme: blue for regular routes, and orange for rush-hour routes. Service to new subdivisions was often provided by way of long one-way loops, which is an inexpensive way of serving new areas, but are inconvenient and slow for potential riders. 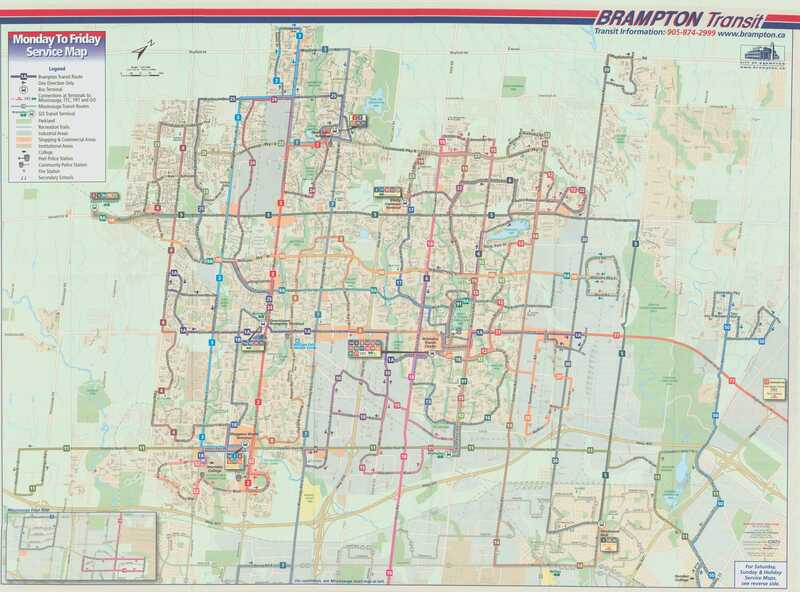 Notable in the 2001 map below is Route 77, launched in the 1990s as a joint Brampton Transit/Vaughan Transit route between Bramalea City Centre and Finch Station along Highway 7. Route 77 was a very slow way to get to the subway from Brampton, but it operated until Züm began service in 2010. In 2001, bus service on 11 Steeles was finally extended to Humber College’s main campus. 2005 marked an important turning point for Brampton Transit, as it introduced a grid-based route system on major arterials. Route 14 Torbram, for example, no longer served Bramalea City Centre, but continued north, providing a core north-south route; many other routes were straightened, including Route 2 Main north of Downtown. Changes since May 2005 saw service frequencies improved, more local routes added, and improved connections. The current system map, dated September 2017, can be found on Brampton Transit’s website. This entry was posted in Brampton, History, Maps, Transit and tagged Brampton, Brampton Transit, History, Maps, TVO, Writing. Bookmark the permalink.